While reviewing in-depth grammar rules, LIFEPAC 11th Grade Language Arts teaches English usage and variety in a concept by concept format. Units cover: Sentence Workshop, Why Study Reading?, Nonfiction, American Drama, and American Novel. Grammar covered in this exciting course includes nonstandard English, clauses and phrases, verbals, participles, and conjunctions. Students will also explore American writing and other writing styles. 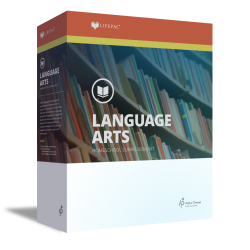 The LIFEPAC 11th Grade Language Arts Set contains ten worktexts, the play Our Town and the novel The Old Man and the Sea, and a teacher's guide.